Credit: Image courtesy of the University of Chicago. A study published in Science last week relies on extremely bright X-ray beams from the U.S. Department of Energy's (DOE) Advanced Photon Source (APS) at Argonne National Laboratory to confirm the presence of naturally occurring water at least 410 kilometers below the Earth's surface. This exciting discovery could change our understanding of how water circulates deep in the Earth's mantle and how heat escapes from the lower regions of our planet. Through use of the APS, a DOE Office of Science User Facility, the researchers identified a form of water known as Ice-VII, which was trapped within diamonds that crystallized deep in the Earth's mantle. 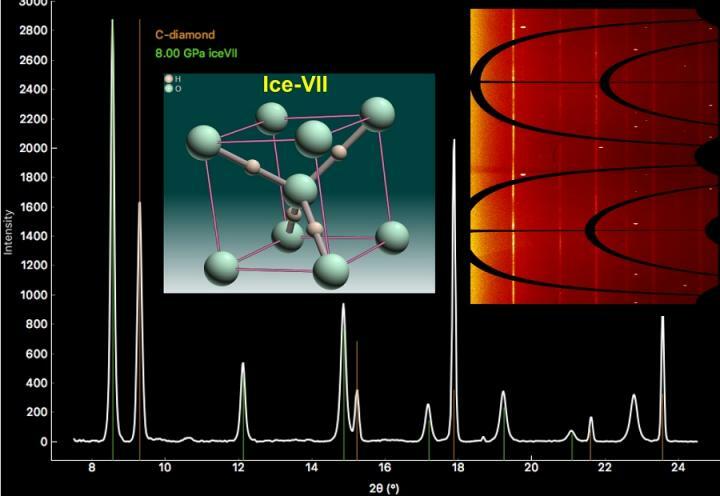 This is the first time Ice-VII has been discovered in a natural sample, making the compound a new mineral accepted by the International Mineralogical Association. In other geological studies at the APS, researchers have used high-pressure chambers and lasers to put materials under extreme pressure and temperatures for study, literally recreating the conditions deep below the Earth's surface to understand what happens there. "In this study, thanks to the amazing technical capabilities of the APS, this team of researchers was able to pinpoint and study the exact area on the diamonds that trapped the water," said Stephen Streiffer, Argonne Associate Laboratory Director for Photon Sciences and Director of the APS. "That area was just a few microns wide. To put that in context, a human hair is about 75 microns wide. "This research, enabled by partners from the University of Chicago and the University of Nevada, Las Vegas, among other institutions, is just the latest example of how the APS is a vital tool for researchers across scientific disciplines," he said. "We are interested in those inclusions because they tell us about the chemical composition and conditions in the deep Earth when the diamond was formed," said Antonio Lanzirotti, a University of Chicago Research Associate Professor and a co-author on the study. After many millions of years, diamonds are pushed up from the Earth's mantle to the surface, where many are mined for jewelry and industrial purposes. To positively identify the composition of the inclusions, mineralogists needed a stronger instrument. That's where University of Chicago's GeoSoilEnviroCARS's (GSECARS) beamlines at the APS came in. GSECARS operates a suite of instruments at the APS dedicated to frontier research in the Earth sciences. Because of the pressure required for diamonds to form, the scientists know that these specimens formed between 410 and 660 kilometers below the Earth's surface. "This wasn't easy to find," said Vitali Prakapenka, a University of Chicago Research Professor and a co-author of the study, who said that the team used high-resolution diffraction techniques to get the right scans, or images, of the Ice-VII. "People have been searching for this kind of inclusion for a long time." The researchers said the significance of the study is profound because it shows that flowing water is present much deeper below the Earth's surface than originally thought. Going forward, the results raise a number of important questions about how water is recycled in the Earth and how heat is circulated. Tschauner has said the discovery can help scientists create new, more accurate models of what's going on inside the Earth, specifically how and where heat is generated under the Earth's crust. This may help scientists better understand one of the driving mechanisms for plate tectonics. For now, the GSECARS team is wondering whether the mineral Ice-VII will be renamed, now that it is officially a mineral. This is not the first mineral to be identified thanks to research done at the APS beamlines managed by GSECARS: Bridgmanite, the Earth's most abundant mineral and a high-density form of magnesium iron silicate, was researched extensively at the APS before it was named. Tschauner was a lead author on that study, too. Other GSECARS team members who are co-authors of the Science journal article, "Ice-VII inclusions in diamonds: Evidence for aqueous fluid in Earth's deep mantle," are Eran Greenberg, Dongzhou Zhang and Matt Newville. In addition to the University of Chicago and the University of Nevada, Las Vegas, other institutions cited in the study include the California Institute of Technology, China University of Geosciences, the University of Hawaii at Manoa and the Royal Ontario Museum, Toronto. Data was also collected at Carnegie Institute of Washington's High Pressure Collaborative Access Team at the APS and the Advanced Light Source, a DOE Office of Science User Facility. The research was funded, in part, by the U.S. Department of Energy's Office of Science (Office of Basic Energy Sciences) and the National Science Foundation.